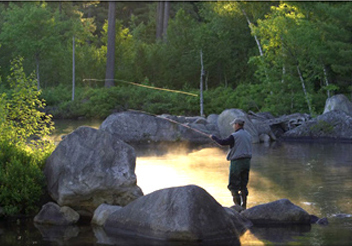 Our proximity to the vast watershed of the Penobscot puts you in the fishing trip of your dreams. Fish some of the best lakes, ponds and rivers in the Northeast for small mouth bass, brook trout and landlocked salmon. Choose from an action-packed bass fishing vacation trip, a hike into a pristine pond to fish for native brook trout, or try fly fishing in Maine for landlocked salmon on the famous West branch of the Penobscot River. Trips include Licensed Registered Maine Guide, boat or canoe, equipment, and a hearty picnic lunch. Small mouth bass fishing in Maine is ideal from late May through the end of September. The shores of the West Branch of the Penobscot River in Millinocket are the perfect location for your Maine fishing adventure. Our great resort location allows anglers the ability to wake up and be bass fishing in some of the most productive waters in Maine. Brook trout is one of the most sought after game fish in the state of Maine. Our Twin Pine Camps in Millinocket are located just minutes from the many pristine ponds in and around Baxter State Park. At NEOC you’ll experience the thrill of casting a dry fly to rising brook trout while enjoying a beautiful view of Katahdin. You can also choose to fish on your own or with one of our veteran Maine Guides (they provide great witnesses for catching the “big one”). Fishing during the caddis hatch on the West Branch is guaranteed to be one of the more memorable experiences in an anglers lifetime. The West Branch of the Penobscot River is famous for its landlocked salmon and is one of the best natural landlocked salmon fisheries in the eastern United States. Many local anglers rave about the size of the fish that live in these waters where the average catch size is between 12-14 inches. From May-September we customize amazing fishing trips on the West Branch. Fishing during the caddis hatch on the West Branch is guaranteed to be one of the memorable experiences of an angler’s lifetime. NOTE: For lodging mid – June to September refer to the regular pricing grid for Twin Pine Cabins.